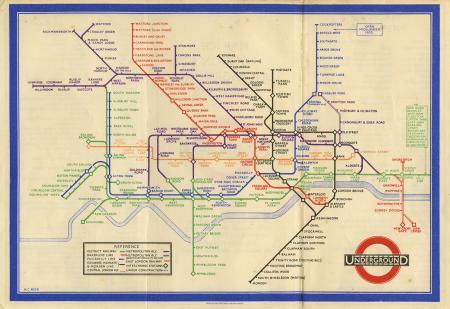 This is the first pocket edition of the diagrammatic style of Underground map designed by H C Beck. The main features of this diagram are the use of 45 degree angles and diamonds to illustrate interchange stations. All the lines are shown in their entirety except the District line which is only shown as far as Mile End, the rest of the stations eastbound are listed to Southend. The Piccadilly line extension from Enfield West to Cockfosters is shown as opening Midsummer 1933. The logo on this map is a red and black roundel with UndergrounD printed on the bar. The reverse of the map lists places of interest and theatres, with their closest Stations. Printed on paper.